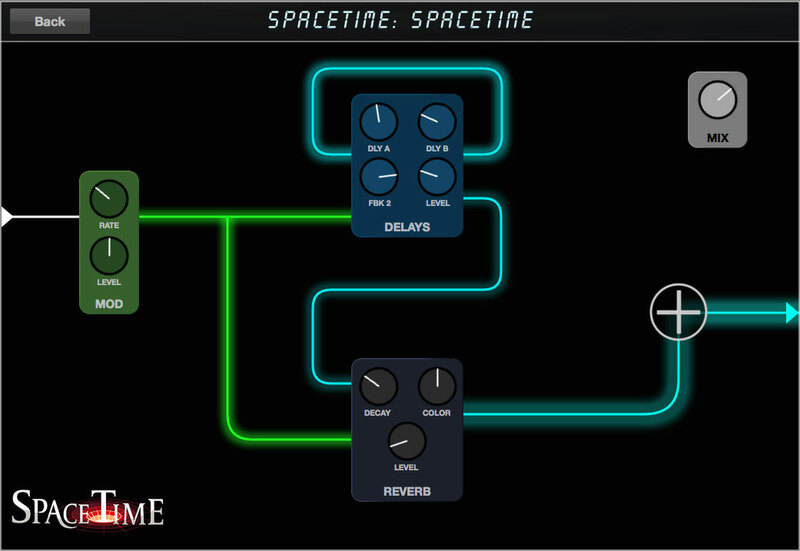 SpaceTime is a multi-effects algorithm combining Modulation, two Delays, and Reverb into one, easy to use effect. Modulation is most similar to a chorus and is the first effect in the signal path. The Delays are based on Eventide's Vintage Delay Algorithm from the TimeFactor pedal and the Reverb section draws from both the Plate Algorithm in Eventide's SPACE pedal, as well as Eventide's ULTRA REVERB Native Plug-in. 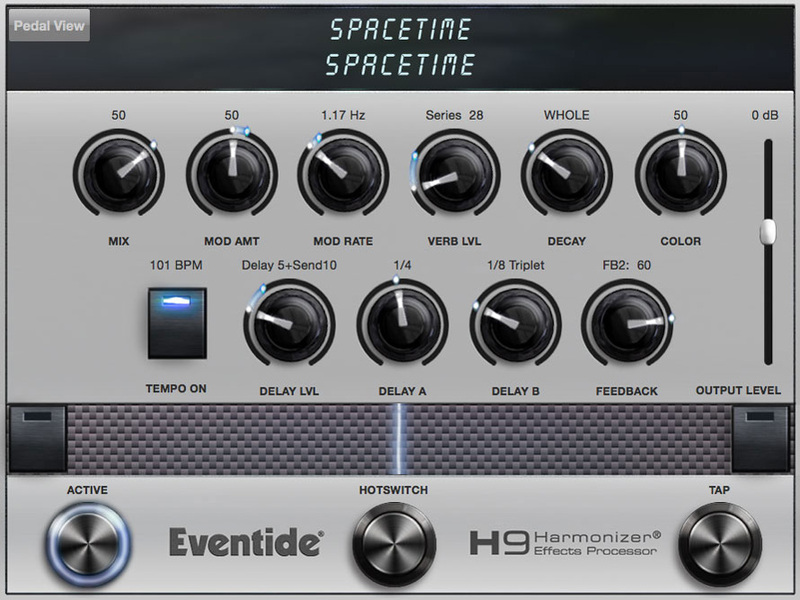 Unique to SpaceTime is the ability to route the Delays and Reverb in series or parallel after Modulation, further adding to its versatility and creative applications. Controls overall algorithm wet/dry balance. 100% is all wet signal. Adds Modulation to entire signal path. Modulation depth also increases as you go from 0 to 100. Adjusts the speed of the LFO controlling the Modulation section of SpaceTime. Continuously adjustable from 0.05Hz to 12.46Hz. Adjust the output level of the Reverb and routes the Reverb in Series after the Delays or Parallel with the Delays. The first half of the knob adjusts Series Reverb level from 0 to 100 while the second half of the knob switches to Parallel routing and adjusts Reverb level from 0 to 100. Percussive playing coupled with long Delay times and short Reverb Decay times will showcase parallel routing. Sets the decay length of the Reverb in seconds or Note Divisions when in Tempo Mode. Changes the Reverb character from small and dense (set to 0) to large and spacious (set to 100). Controls the amount of both Delays in the signal path. Can also be used to set the dry to wet blend of delayed signal sent to the Reverb in the series path. With DLY LVL set less than 50, dry signal and Delayed signal are both sent to the Reverb section. After 50, DLY LVL reduces the dry signal sent to the Reverb allowing only the delay repeats to have Reverb when the control reaches 100. Sets the Delay time for Delay A from 0 to 2500ms when TEMPO is OFF. With TEMPO ON, Delay is sync'ed to the TEMPO BPM and is adjusted in note division increments from No Delay (NO DLY) to a Whole Note (WHOLE) in the most common note divisions. Sets the Delay time for Delay B from 0 to 2500ms when TEMPO is OFF. With TEMPO ON, Delay is sync'ed to the TEMPO BPM and is adjusted in note division increments from No Delay (NO DLY) to a Whole Note (WHOLE) in the most common note divisions. Adjusts the amount of feedback for both delays and contains two feedback types (F1 and F2). F1 links both delay times to create a rhythmic, repeating pattern where the longer delay sets the pattern length. The shorter delay will not repeat again until the longer delay has passed. F2 is a traditional feedback control, where delay times are independent. The Middle Footswitch can be programmed to act on the loaded Preset as a programmable controller allowing the user to switch between the normal Preset parameter values and a programmed, alternate set of parameter values. It’s like having two Presets in one! When a Preset is loaded with a HotSwitch assignment, the Middle Footswitch LED will be lit GREEN to indicate that the HotSwitch is “active.” (If the HotSwitch is not programmed, the LED will be unlit.) Press and release the HotSwitch and the Preset’s parameter values will change to their HotSwitch programmed values, the LED will turn orange and the display will indicate which of the parameters have been modified by the HotSwitch. If only a single parameter is under HotSwitch control, the parameter’s value is displayed. If multiple parameters are under HotSwitch control, the display is a graphic representation of the Control Knobs. Control Knobs that are controlled by the HotSwitch are represented as circles while unassigned Control Knobs are indicated by a solid line (dash). Press and release the HotSwitch again and the Preset’s parameter values will return to their default values (Preset values) and the HotSwitch LED turns GREEN. In this way, by pressing and releasing the HotSwitch you can toggle between two settings for the loaded Preset. You can also use the HotSwitch to only momentarily change the parameter values rather than toggle between the two settings. Press and hold the HotSwitch and the values will change while holding and revert back to the previous value upon release. .